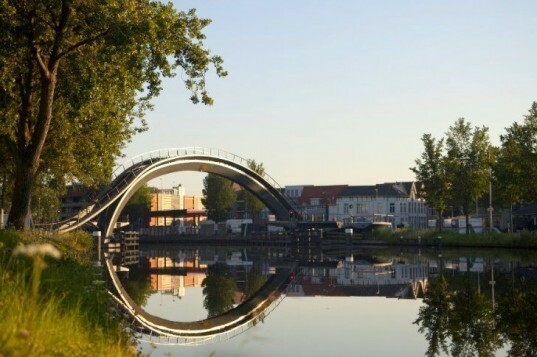 Melkwegbridge is a new pedestrian bridge in The Netherlands that dramatically arches over a canal to connect the historic part of Purmerend to the new district. Designed by NEXT Architects, the bridge offers 2 ways to cross the canal, either via the arch on foot or on a low angled, Z-shaped bike path. The bridge is part of a larger master plan to provide greater connectivity throughout the city and the new landmark is destined to become the subject of "sunset reflecting off the canal" photographs. The new Melkwegbridge spans a distance of 66 meters across the canal to connect the Weidevenne District to the historical city centre of Purmerend. NEXT Architects, with the help of Ronald Rietveld Landschaparchitectuur, began planning the bridge in 2007 and recently completed the project in October of 2012. Their goal was to create a new area with a specific identity, which would also work as a connector between the old and the new centre. The bridge is most notable for its massive arch, which reaches a height of 12 m above water level and stands in a continuous line with the Melkweg-road, thus offering an excellent view over the city. Additionally the bridge features a cyclist and wheelchair path which runs 100 m in length and has a gentle slope to accommodate the differences in height between the opposing banks. The arch however remains the fastest way to cross the canal despite it’s dramatic height. Made from steel, the 85-ton arch bridge has 130 steps and creates a unifying project with the z-shaped cycling path. LED lights integrated into the bridge’s paths provide illumination at night as well as a dramatic space from which to view the sunset and the city beyond. The new Melkwegbridge spans a distance of 66 meters across the canal to connect the Weidevenne District to the historical city centre of Purmerend. NEXT Architects with the help of Ronald Rietveld Landschaparchitectuur began planning the bridge in 2007 and recently completed the project in October of 2012. Their goal was to create a new area with a specific identity, which would also work as a connector between the old and the new centre. The bridge is most notable for its massive arch, which reaches a height of 12 m above water level and stands in a continuous line with the Melkweg-road, thus offering an incredible view over the city. Additionally the bridge features a cyclist and wheelchair path which runs 100 m in length and has a gentle slope to accommodate the differences in height between the opposing banks. The arch however remains the fastest way to cross the canal despite it's dramatic height. 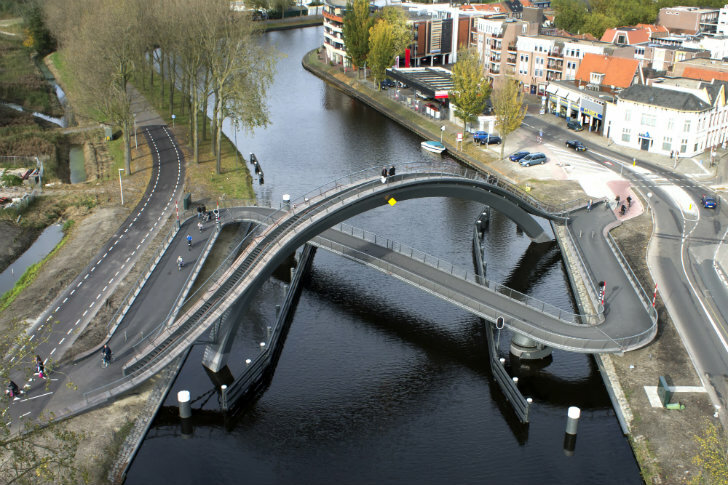 Made from steel, the 85 ton arch bridge has 130 steps and creates a unifying project with the z-shaped cycling path. LED lights integrated into the bridge's paths provide illumination at night as well as a dramatic space from which to view the sunset and the city beyond. A view of the arching bridge from the banks of the canal. Site plan and connection to the city centre.